Alyssa Gagliardi, who scored the first two goals of her NWHL career and added an assist as Boston defeated Buffalo on Saturday, 3-2, for the Pride’s first win of the season, has been named the NWHL Player of the Week. Asked for her reaction, the humble defender declined to discuss the individual honor and instead focused on her team’s victory. "We played a solid team game on Saturday and it's nice to get that first W and get back into the win column,” said Gagliardi, an original NWHL and Pride player. "We have high standards for ourselves in the locker room, so it was a fun game to get us back on track to where we want to be." The former Cornell standout scored at 4:31 of the second period to start the flurry of scoring for the Pride. She also notched an assist on Jordan Smelker’s goal less than two minutes later. A minute later she netted her second goal of the night and the third for the Pride in the period. "We put together a full 60-minute effort and we're excited to build on the win heading into this week of practice and our next game,” said Gagliardi. Gagliardi, 25, was one of four recipients of the 2016-17 NWHL Foundation Award, given to the players most actively applying the core values of hockey to their community as well as growing the game. In 34 games over the first two seasons of the NWHL, Gagliardi had 11 assists. A captain at Cornell in her senior season, Gagliardi was 19-70-89 in 138 games over four years at the school. She studied Communications and Business, and currently works for a start-up company in the Boston area. 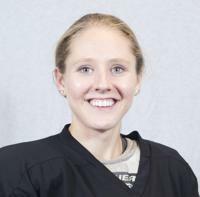 Gagliardi started as a roller hockey player in the Philadelphia area when she was very young. She began playing ice hockey when her family moved to Pittsburgh when she was six. Her family moved again when she was ten, this time to Raleigh, N.C., and Alyssa played for the Raleigh Youth Hockey Association and Carolina Eagles before going to school and playing at the legendary Shattuck St. Mary’s in Minnesota.